The Torigoe Matsuri is one of the most important matsuri in Tokyo. It is not the most famous matsuri as that probably belongs to the Sanja Matsuri in Asakusa. The Torigoe Matsuri is located in Asakusabashi, close to Ryogoku and south of Asakusa. Due to its location, it is not as well-known and many people will pass over it. It is a major matsuri that has hundreds, if not thousands of people attending. The festivities last all day, but it really doesn’t get lively until night falls. I originally felt the Torigoe Matsuri would be a standard matsuri but I was very surprised at what I saw and I completely underestimated what I was getting myself into. The Torigoe Matsuri is famous for having the largest mikoshi in Tokyo. Rurousha has one of the only explanations of the Torigoe Mikoshi by explaining that it is a “Sengan Mikoshi”, a 1000 kan mikoshi. Simply put, it is a very large mikoshi that weighs roughly 3750kg. This is just a little over 4 short tons, or somewhat less than a long ton or a metric ton. When I approached the Torigoe Matsuri, I had no idea what I was going to be in for until I came upon the main street, Kuramaebashi-dori. The actual matsuri forces the closure of Kuramaebashi-dori. This is not a light hearted affair as closing a 4 lane street in Tokyo is usually limited to the large centres such as Akihabara, Ginza, and Shinjuku. These areas are closed to traffic on weekends only, and only during the day. 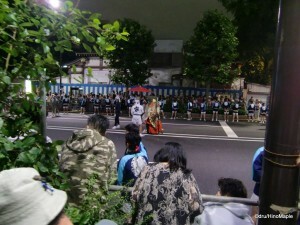 At the Torigoe Matsuri, they also rope off the street to prevent people from entering and they have a lot of security. Near the entrance to Torigoe Shrine, they place lots of people in happi lining the street to prevent people from climbing over the ropes and entering. I thought it was pretty strange to see but didn’t really think twice at first. I decided to head towards the main action where things got busier and crazier. Shrine Security - The calm before the storm. A mikoshi is simply a portable shrine where the god is inside temporarily and it is carried by a group of people. It is usually an orderly event. In Rurousha’s post about the Shitaya Matsuri, she goes into detail about the symbolism and how it is moved. The Torigoe Mikoshi, being the largest in Tokyo, is held by several different groups of people. These groups are rivals with each other and they all vie to carry the shrine. It is very common for the people to push and shove each other in order to help carry the mikoshi, but I couldn’t actually see this happening as I didn’t have a front row vantage point. 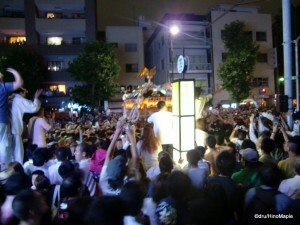 After returning from the Torigoe Matsuri, I read Gregg’s blog post from 2003 talking about the Torigoe Matsuri. It was an interesting account that hasn’t really changed. There are a few things that he didn’t note in his blog. He failed to mention the proliferation of yakuza within each of the groups as well as the crowds. While I can’t say for certain that many of the people there are gangsters, I did see the typical gangster types all over mixed with the regular people. It was very crazy to watch all of the people running around and I even saw one fight. I assume that the fight was with younger people as when I was in the food stall areas, the only beat up people I did see were young men. All those hormones really don’t help when everyone is trying to have a turn at carrying the heaviest mikoshi in Tokyo. Thankfully the violence is only located near the mikoshi itself. The police were everywhere around the mikoshi there trying to keep the peace and they did have to usher a few offenders away. Generally, the police tried to keep most of the people away from the mikoshi, but they failed often as dozens of people would break the line and get through. Overall, the Torigoe Matsuri was definitely an experience. I would like to go back again but I hope to be better prepared. It is a little dangerous and very difficult to get around. Being aware of your surroundings helps a lot. There are too many people lining the streets and unless you have a prime position staked out hours in advance, you are probably not going to see a lot. 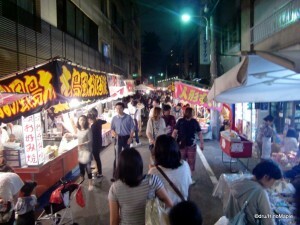 Like any other matsuri, you will find a lot of standard things such as food stalls, games, trinkets, and lots of people in happi. I would say that you will see more people in happi than in other standard matsuri but probably not as many as the Sanja Matsuri. It is a lot of fun and a little stressful due to the numbers of people in attendance. If you are in Tokyo around the beginning of June, you should check it out as it may be a once in a lifetime experience. This entry was posted in Festivals, Tokyo and tagged 1000 kan, Asakusa, Asakusabashi, festival, japan, kan, Kuramae, Kuramae-dori, matsuri, mikoshi, Ryogoku, sengan mikoshi, Shitaya Matsuri, Taito, Taito-ku, tokyo, Torigoe, Torigoe Matsuri, Torigoe Mikoshi, Torigoe Shrine, Torigoe-jinja by Dru. Bookmark the permalink. You’re a brave man, Dru! I’m within walking distance of Torigoe, but I’ve never attended the festival at night. Too hectic. I can’t vouch for the truth of this statement, but I’ve been told (by neighbours) that there’s such heavy security partly to protect bystanders. The mikoshi is so heavy that it’s not always possible to control it, so it can easily crash into the surrounding crowds and cause injuries. Usually only one local group carry a mikoshi, but this one’s so big that different groups have to share the burden. I suspect there’s a lot of testosterone-driven rivalry under that miskoshi! It’s a good thing you don’t go there. It annoyed me a little and I would much rather be in someone’s apartment from above to watch it. I can believe what your neighbours said. Although I also think that the testosterone driven men are another problem along with the potential underground aspect of the matsuri. I also can’t confirm any of it, but just from observations. PS: I have a video of the matsuri posted now. You can actually see people jumping into the crowd, like body surfing, just trying to get towards the mikoshi! We always seems to miss out on any festival while we were in Japan. Must make a supreme effort to attend at least, one of these day, despite the crowd because they sure look interesting!